Diver Flare is a DEMA Member. "This is a fantastic life saving product and an absolute must for all divers..."
"The review, carried out by a BDA staff member and PADI Divemaster, achieved 5 out of 5 stars for Value for Money, Quality of Manufacture and Performance, as well as 4 out of 5 stars for Practicality." The percentage of divers unrecovered by dive boats due to them not being seen in the water is alarmingly high! A diver on the surface being swept sea-ward by a retreating tide happens all to many times. A diver in distress, no buddy in sight, surface conditions deteriorating. Panic sets in! All too many times divers perish simply because they have not been seen. These examples of true life experiences have been our catalyst to try to come up with an idea to enable a diver to be recovered a lot sooner than they are at the moment. We have our surface marker buoys. We have whistles. We shout. We have air horns, strobes and torches, and sure enough in a lot of cases due to us as divers being at sea level with a rolling swell and the wind in the wrong direction they are all but useless. Too many times divers who have experienced these conditions say the same thing every time - they could see the boat but it couldn't see them!! 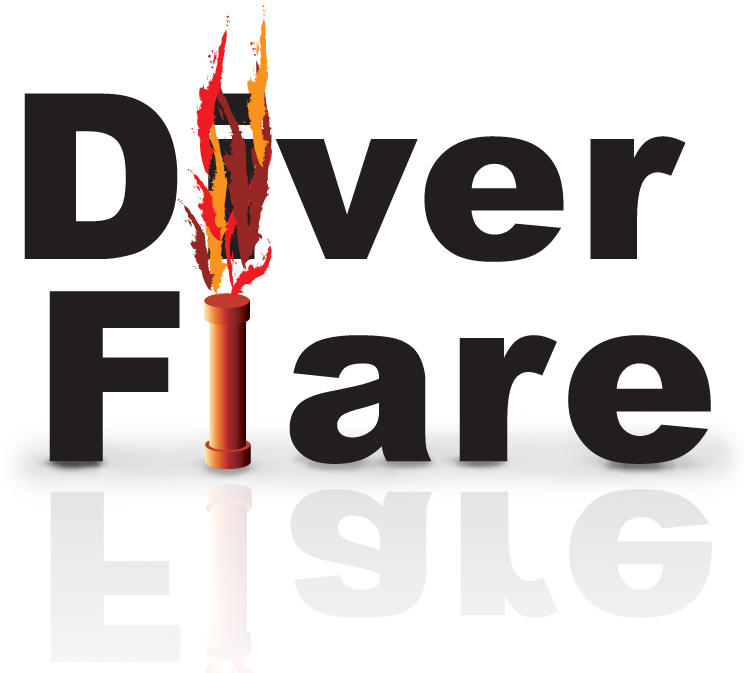 Diver flare gives divers a more than fighting chance of being that recovered diver. With a pyrotechnic flare on hand, on every dive. Dry, ready to use, with a full minute's burn time and in your hand in less than a few seconds has to be our best chance to be recovered. The distance it can be seen on the surface of the sea far outweighs any other piece of equipment a diver carries. We believe our diver flare will save lives and if it only saves one we will have achieved what we originally set out to do. Diver Flare is a DEMA Member.